With Christmas only a few days away, I wanted to share the one Christmas craft I created this year. Last year, I created three wreaths and used a red and silver color scheme to decorate our mantel. This year, I wanted to switch this up, and the idea started with creating a fabric Christmas tree. After spray painting the canvas and waiting for it to dry, the first step was to cut strips of the fabric that would form the layers of the Christmas tree. I cut 4” strips of each of the fabrics. Once the strips were cut, I was ready to glue them on the canvas. I left room at the bottom to add the tree ‘trunk’. I allowed for a 1” overlap of each layer, meaning that you would see 3” of each strip. I also left room at the top to add the star. To keep my line of hot glue straight, I measured and marked a straight line with a pencil. I worked in 3”-4” wide sections at a time (so the glue wouldn't dry) and just tried to scrunch and press the fabric to the glue. I wanted it to create a sort of ruffle-y, skirt-like feel. As I worked my way up the tree, I had to trim some of the excess fabric off of the end of the strips. I waited until I had glued it down though to make sure I had enough fabric. Once all of the layers were glued on to the canvas, I was ready to add a few embellishments. I used the red and silver ribbon and attached them to the canvas with festive pearlized straight pins I found in my scrapbooking supplies. Before attaching the star to the top of the tree, I decided it needed a darker background (instead of the silver canvas) so that it would stand out. 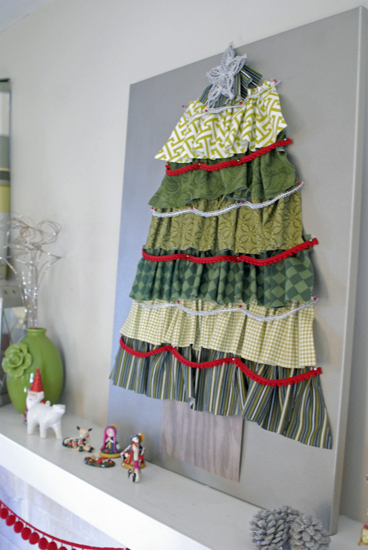 I cut a small section of one of the fabrics and scrunched and glued that to the top of the tree. I then added the star (with hot glue) to complete the tree. The last step was to add the ‘trunk’. I found a piece of brown wood-grain scrapbook paper and cut it to fit under the tree. The fabric Christmas tree was ready for our mantel! To complement the tree I added a few decorations we already had and purchased a few new ones to complete the space. I started with our silver lantern and a green vase. In the lantern, I changed out our normal green candle and added the red and silver one. Into the green vase went silver twisty branches. I also added a sparkly silver tree ornament and a clay nativity scene that my mom gave us a few years ago (from Ten Thousand Villages). The two new decorations on this side of the mantel are two ornaments I found at Target - the sparkly Santa-gnome and his sparkly polar bear. On the other side of the mantel I added height with the mountain-man nutcracker (one of Andrew’s favorites!) and the clear vase with red and silver tinsel and more sparkly branches and embellishments. I then layered in the reindeer, silver pine cones, another sparkly tree ornament, and a small wind-up snowman (a gift from my dad, I’m sure ;) ). The only new item on this side of the mantel is the silver and white penguin - sparkly, of course! The only things I did keep the same as last year are the red pom pom garland and our stockings. I love the collected and colorful feel our mantel has this year. And I’m happy with how the fabric Christmas tree creates a nice focal point. I love the plate the nesting Santas are sitting on. It has four snowmen dressed in different ethic outfits and around the rim of the plate is “Merry Christmas” in different languages. My mom picked it out for me a few years ago when I was still teaching Spanish. For next Christmas, two things I would like to add to our decorations are a new bow, or other tree topper, and a new wreath for our front door. I want to wish everyone a safe and joyful holiday season. We’ll be enjoying time with friends and family and holding everyone extra close this year. May your Christmas and 2013 be filled with many blessings! ° What is your favorite holiday tradition?